Coconut Hemp Milk: Great for the Whole Family! When people find out that Paul and I are vegetarians one of the first things they ask about is if our kids are too. Next, when they find out we don't drink cows milk they ask what we give our kids ... especially our babies. First off, yes our kids are vegetarians too. Secondly, our kids are kids, not cows so they don't have cows milk. I don't mean to sound harsh, but that's the way it is. Guess what, they are all growing great (all three have been in the 90% for height and weight), their digestive systems are awesome and I can count the times we've been to to doctor for sick visits on one hand. Personally, I think they're doing okay without it. Since Paul and I started dating, milk has always been a topic of conversation. I loved cows milk and he is lactose intolerant. I still remember one day he switched our milks and I almost spit out an entire glass of rice milk on the counter. It was disgusting! After about a year of marriage, I started trying more of his milk on cereal and things but it had to be vanilla flavored and sweetened. Fast forward ten years ... the whole family now drinks unsweetened original milk alternatives ... usually almond or coconut milk. If it's vanilla flavored or sweetened, the kids are spitting it out on the counter. I can't believe how sweet that stuff is ... and why does milk need to have added sugar?! When Gabe stopped nursing, I did a lot of looking into what was the best 'fattening' milk out there besides whole cows milk. After a lot of digging around, I quickly fell in love with hemp seeds. According to Pure Healing Foods, they have the most concentrated balance of proteins, essential fats, vitamins and enzymes combined with a relative absence of sugar, starches and saturated fats.Their proteins are easily digestible while being an excellent source of essential fatty acids including Omega 3, 6 and Gamma Linolenic Acids (GLA). People who have allergies to nuts, seeds, sugars and lactose are not effected by hemp seeds ... there are no known allergies to hemp! That's amazing! When he was 10 months he started drinking hemp milk ... no I did not wait until he was a year. He loved it. It was pretty expensive, but I was still working at a place that I got a great discount on it. 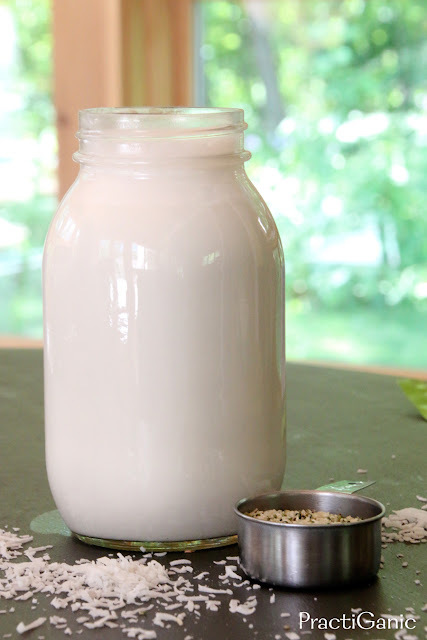 He stayed on hemp milk until about 18 months and then switched to what Paul and I drank, almond or coconut milk. By the time Savina came around, we tried hemp milk again (at 10 months) and that stubborn little girl just would not drink it. I tried making it homemade to save money, but she still didn't like it. There was nothing I could do to coax her into it. For her, we did coconut milk and simply kept hemp seeds in her diet via food. Now, it's Simon's turn. He's 10 months and it's milk time! For the past four years, the price of hemp seeds has really come down. I used to have to wait for our health food store to have them on sale (about once a quarter) and I would buy all the seeds on their shelf. They were $5/8oz bag when on sale. Now, I can buy a bag at Trader Joe's for about $4 ... no sale needed! Finally, it's cost effective to make my own hemp milk for him. To save bit more and get larger variety of vitamins and minerals, I wanted to do a mix of coconut and hemp. Plus, I love the healthy fats it provides as well as being a good source of iron! After my first batch, Paul and I just about died the flavor was so good. 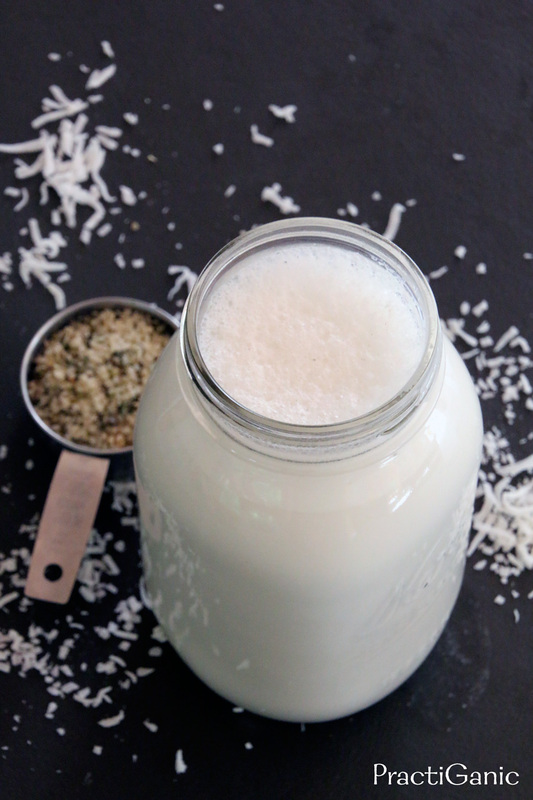 Even though we have hemp seeds almost daily in our food, we hadn't had the milk in a few years. The coconut added to it was the perfect complement. Paul and I both started drinking it more as well. I quickly realized that this was going be the new milk for the whole family! Making it from scratch is more cost effective than buying the half gallons of Almond/Coconut milk too. Plus, it's so nice not to have multiple milks in the house. I'm not going to lie, at first Simon was not a huge fan. He wanted his old milk. 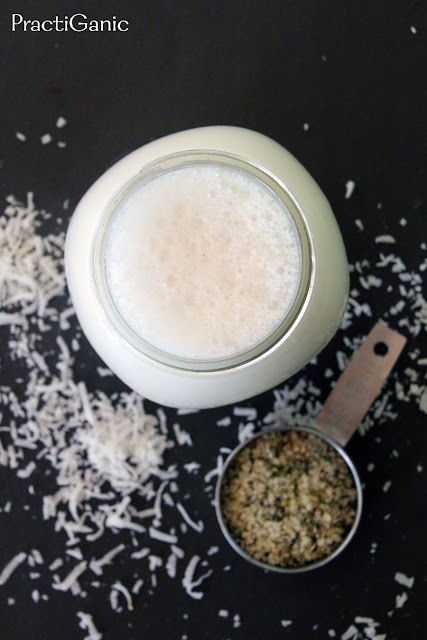 However, after three short days he was back to his normal milk intake and enjoying the new flavors ... and I was loving that he was getting all of that great goodness that hemp and coconut provide! One last thing that drives me crazy about milk alternatives. Watch out, I'm going to get a little intense here. Why is sugar needed and why do they label one of the milks 'unsweetened'. The manufacturers add sugar to their milk. It is not a natural product of nuts, coconut, soy or any other milk that your are buying. If you look, the second ingredient is almost always cane sugar. These milks should be labeled 'sweetened' and the regular, unflavored shouldn't be labeled at all. Please, stop adding extra, unneeded sugar to your diet. I know a lot of recipes out there that add dates to their milk for sweetening. Yes, the flavor tastes good, but there is a time and a place for sweet foods ... your daily milk intake is not one of them. If you want to make a dessert with this recipe, sure ... add 1/4 c of dates and a dash of cinnamon but remember: it's for dessert, not dinner! Put all ingredients into a high speed blender and blend for 3 minutes. 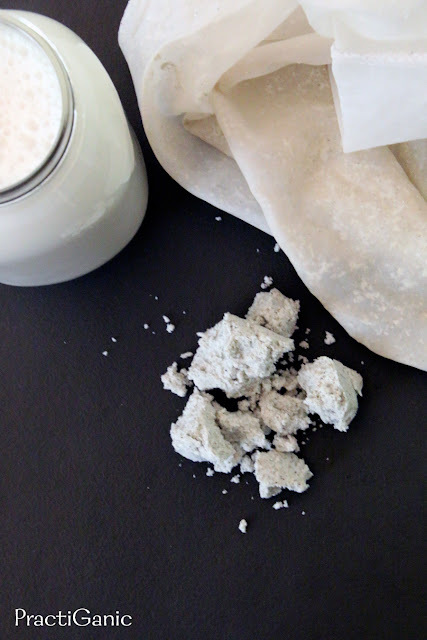 Using a cheese cloth, towel or reusable grain bag, pour the milk in and strain all of the pulp. Don't throw out the pulp! Add it to your homemade nut butters, muffins or other baked goods. *I love the bold strong flavor and the heavy dose of healthy fats, vitamins and minerals. If you're more of a 'skim milk' kind of person, feel free to add an extra cup of water.